It’s that time of year again – the leaves start to change and the temperature starts to drop. While fall is beautiful, it means that soon cold weather will force us to kickoff treadmill season. For some, this is a welcomed change. For others, however, the ‘dreadmill’ is a last resort. Treadmills do however present us with benefits that road and trail running simply cannot. Here are four reasons to hop on a treadmill for your cardio this coming winter, as well as a killer treadmill workout to test out. Control. 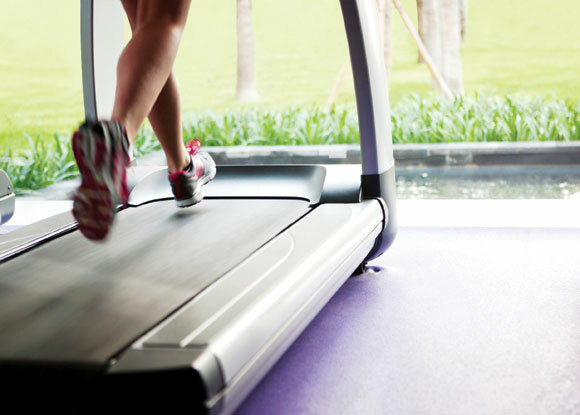 Treadmills allow you to control the speed and incline at which you’re running. Sure, you’re in control on the road, but with a treadmill you simply hit a button and it takes you where you want to be. There isn’t a guessing game as to what incline you’re running or how fast you’re going. I find this to be particularly helpful when I’m doing sprint or timed intervals. Efficient. The idea that every workout needs to be 90 minutes long is just wrong. If you work hard, you can get a great workout done in 30 minutes. Treadmills allow you to crank up speed and/or incline to levels that you probably wouldn’t hit out on the road. Variety. There are so many ways to change a workout using a treadmill. By altering your incline, speed or time intervals, you can come up with hundreds of workouts, all with their own unique settings. Some may think that treadmills are dull and repetitive, but with a little creativity, they are anything but boring. Weather. It’s always sunny and 75 on the treadmill. You don’t have to pack that extra pair of leggings when you’re running inside or need to worry about slipping on icy streets. This wouldn’t be much of a treadmill post if I didn’t also leave you with a solid workout to complete, would it? Well, you’re in luck. 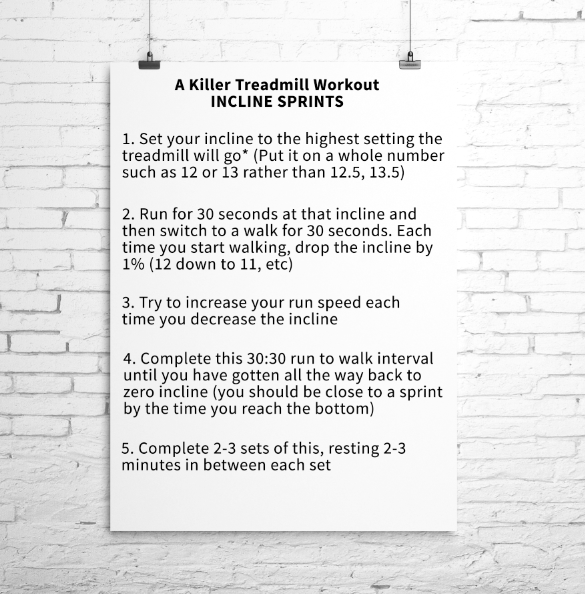 I’m leaving you with one of my favorite treadmill workouts. It targets both incline and speed, and keeps you changing things up to prevent boredom. *I use a Woodway treadmill that goes up to an incline of 25% and usually do 2 complete sets. With warmup and cooldown, it generally takes me almost exactly hour. Most treadmills will go up to 12-15% incline. If this is the case with you, I would recommend trying to do at least 2 sets. Also, if you’re pressed for time, you can also increase the speed, which will make it a MUCH more challenging workout.